At PAX East this year we got a hands-on demo of Nvidia’s 3D vision technology, complete with their IR shutter glasses. Now, the effect is exceptional, but even in our short demonstration we ran into problems inherent to the technology. Specifically a poorly placed emitter caused some people to lose sync due to line of sight issues. Now we learn that there is a radio frequency alternative on the horizon, and it has more ramifications than just eye-popping games and movies. Permit me to speculate. 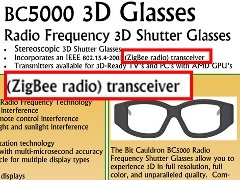 Via an article on 3dvision-blog, I learned that ATI and others are contracting a company called Bit Cauldron to produce RF synced shutter glasses. Immediately there are obvious Pros and Cons. RF will cost more and have shorter battery life, but it will allow for different glasses to sync in different ways, and it won’t rely on line of sight. That is interesting enough and we may discuss the comparison more in the future, but right now something else has captured my imagination. You see, one of the flavors of these RF glasses utilizes Zigbee for its communication. Fans of the open hardware world will immediately recognize the standard. Zigbee is rapidly becoming popular in DIY electronics projects due to ease of use, multi node operation, and ready availability. You can just drop by Sparkfun or adafruit, for instance, grab an Xbee module, and you are all set. That means that there is a fairly good chance that these glasses will be hackable out of the box. Good news for would be 3D experimenters already, but there is one little word in the article that excites me even more. That’s right. Tranceiver. That means send and receive. Now, if the entertainment industry wants 3D to catch on, then they are going to heavily subsidize these glasses. You can expect them to be bundled with video cards, 3D enabled Tvs, BluRay players, maybe even games and movies. It all boils down to dirt cheap, easily obtainable Zigbee radios, complete with their own battery. Now obviously these things are going to be very small, and likely won’t be very friendly to those hoping to repurpose them, but I never cease to be amazed at the ingenuity of the average hacker. There are likely to be speed bumps in the form of proprietary data encoding and the like, but those have been overcome in the past. In the end, 3D glasses could do for ZigBee what the Wiimote did for IR cameras and the Nunchuk did for accellerometers. Even if the glasses themselves don’t offer up any hardware, controlling them with an arduino could be useful, and at the very least you are going to start seeing some cheap zigbee dongles for 3D enabled computers. I can’t wait to see how this develops.